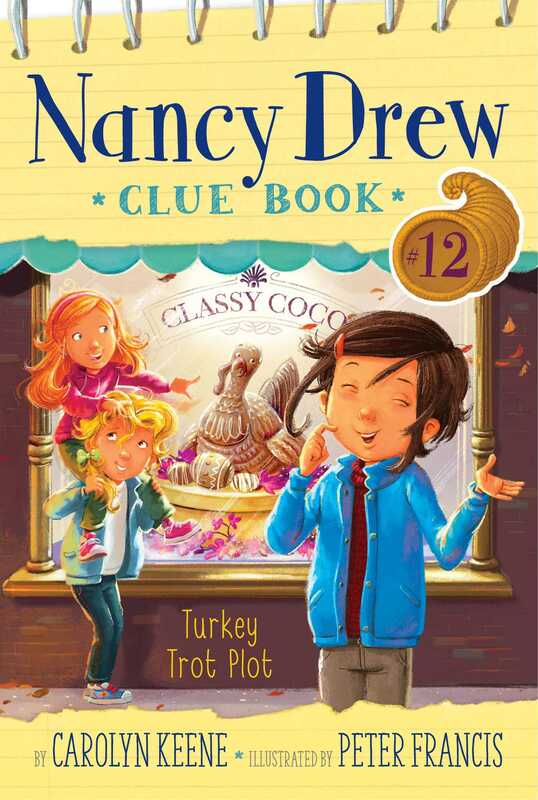 Nancy and her friends search for a missing chocolate turkey in the twelfth book in the interactive Nancy Drew Clue Book mystery series. Nancy, Bess, and George are running in River Heights’s Turkey Trot this year and Bess has designed some super cute turkey-inspired outfits for them to wear. They’re hoping to win the costume contest and receive the winning prize, a giant chocolate turkey from Classy Coco, the new fancy chocolate shop in town. But when the chocolate turkey goes missing the morning of the race, Anna Epicure blames the Turkey Trot runners and bans kids from her shop…forever! Can the Clue Crew solve the mystery of missing chocolate and clear the trotters’ names? Or will the confectionary conundrum leave these three smarties stumped?